McAfee & Taft, the state’s largest law firm, has announced the addition of Allyson J. Crow as a paralegal for the firm’s Intellectual Property Group. Her responsibilities include preparing and filing U.S. and foreign patent applications, trademark applications, patent and trademark responses, renewals, and copyright applications; handling maintenance fee payments for U.S. patents and annuities for foreign patents and applications; handling research projects relating to all aspects of intellectual property law; and providing paralegal support for intellectual property litigation filed in both federal court and the U.S. Patent and Trademark Office. 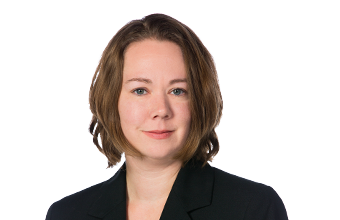 Crow began her paralegal career in 2003 for a California-based law firm specializing in patents, trademarks, copyrights, and intellectual property litigation. Prior to moving back to Oklahoma and joining McAfee & Taft, she worked as a senior trademarks paralegal for one of the nation’s leading audio and electronics manufacturers, where she assisted the company’s legal director for global IP and marketing in the management of the company’s worldwide trademark portfolio, coordinated trademark opposition and cancellation proceedings in the United States and internationally, drafted intellectual property agreements, and assisted with the integration of new trademark and design patent portfolios resulting from company mergers and acquisitions. Crow earned a bachelor’s degree in English from the University of Tulsa and a paralegal certificate in litigation and corporations through the University of California, Los Angeles’ Attorney Assistant Training Program.